Abstract. Advances in digital technologies and, ensuing from them, new communicative exigencies in today’s scientific communication have rendered new forms for scientific knowledge dissemination. In this presentation I have looked at web-based texts for crowdfunding science, an increasingly popular form of scientific outreach supported by digital platforms. I briefly contextualized this genre within today’s changing ecology of research genres with a view to exploring what and, more importantly, how science is communicated to a wide and (super)-diverse audience. How researchers face the new exigencies of online genres and how, if sufficiently digitally literate (and brave), they benefit from the affordances of the new technologies were discussed in relation to effective science telling and selling. Abstract. This paper examines genre and language choice as strategies for “audience design” (Bell, 1984, 2001) in the websites of Spanish research groups. Research groups use their websites for self-presentation, for the dissemination and publicising of scientific activity and results, and for the promotion of their research area. Online affordances (e.g. hyperlinking, multimodality) enable these groups to incorporate and link to information in different formats and languages, in order to connect with multiple audiences. While the desire to reach an international audience promotes the use of English in online environments, the desire to address a local audience promotes the use of the L1. In this paper I explore the interrelation between genres, languages and audiences in research group websites, by analysing 15 websites of Spanish research groups where English and the local language co-exist. I address the following questions: (i) when both English and the L1 co-exist in a single website, how do these languages interact? ; (ii) How do the social characteristics of the conceptualised audience (i.e., the audience that research groups have in mind) affect the choice of language and formats to disseminate information in research group websites? The study provides insights into how research groups are using digital genres not only to become more visible to the international disciplinary community but also to disseminate knowledge to public audiences. Abstract. Pronunciation is often dealt with in passing in the EFL classroom. This study aimed to identify to what extent the approaches of two present-day pronunciation textbooks supported the development of oral productive skills. A critical review showed that the first textbook, very accessible in style, has mismatches between its theory and practice, and an unorthodox representation of speech sounds. It prioritizes motivation and functionality and ignores current research. By contrast, the second textbook, more academic, adopts a cognitivist approach, and presents a highly systematized progression of well-informed lessons considering state-of-the-art research. A quasi-experimental study with two groups of Secondary Education students examined the production of the alveolar fricatives /s z/ and the grammatical allomorphs they are used for. The focus was on this micro-skill of phoneme articulation to contribute to the understanding of the macro-skill of speaking. Application of the first approach showed significant improvement in students’ pronunciation of the target phonemes, but probabilistic tests revealed this cannot be attributed to the methodology. Using the second approach, the students did not just fail to improve but were worse at articulating the sounds. Probability studies confirmed this finding. A final comparative test suggested that neither textbook is apt for the EFL classroom per se. I argue both may lack essential components of effective teaching like attention to the context and awareness of the importance of meaningful learning that can be achieved through communicative approaches and task-based instruction. Considering the findings, some implications for formal teaching and for independent learning (self-study) will be discussed. Abstract. In the context of the internationalization of higher education institutions, policy objectives relating to teaching, learning and research are attracting scholarly attention right now (Sin, 2015). Understanding how faculty are perceiving the impact of internationalization on these three dimensions is an important and missing element that could inform future policy-making, institution-level decision-making, and research on higher education management. As teachers and researchers, they contribute to their institution’s fulfilling its mission and educational objectives. Therefore, exploring the perceptions of faculty members can be instrumental for gaining insights into internationalization processes at grassroots level. Will the drive for internationalization lead to academic programmes sensitive to changes in student demographics? Will it enhance academic competencies and will it contribute to better meeting community needs? Based on a qualitative content analysis (Prior, 2014) of semi-structured interviews carried out with faculty at one institution engaged in the process of internationalisation, we inquired into the following aspects: (i) what internationalization-related activities do faculty observe occurring at their university? (ii) are there any pattern(s) identifiable in these processes? (iii) are these linked to any major concerns about the impact of internationalization on teaching, learning, and research activities? These questions were discussed in light of the respondents’ perception of opportunities and challenges for internationalization and its impact on the triangle teaching – learning – research. Abstract. English is undeniably the lingua franca in many domains, including most academic encounters worldwide. This phenomenon has become a major and expanding field of research within Applied Linguistics. To better understand the dynamics of ELF in academic interactions, there is a need to further investigate ELF usage from its pragmatic perspective in spoken academic genres like lectures. Strategic behavior involving preparedness for potential disturbance in communication and mutual cooperativeness have proved present in ELF research (e.g. Kaur, 2009, 2011) In this respect, three different approaches towards the use of pragmatic strategies in communication can be distinguished: i) Strategies used in pre-work/prospective/proactive talk ii) Strategies used in post-work/retrospective/remedial talk (Mauranen, 2006a); iii) Strategies to establish solidarity among the speakers (Cogo, 2009). The present study is based on the analysis of 12 EMI lectures recorded in two degrees at the University of Zaragoza (BSc in Business Administration and MSc in Nanostructured Materials for Nanotechnology Applications) in order to analyze communicativeness at the pragmatic and discourse analysis levels. The method is based on Quantitative and Qualitative Content Analysis. This study is concerned with two issues: 1) To what extent is there a strategic positioning in EMI lecturing at the University of Zaragoza? 2) What kind of pragmatic strategies are more widely used: Prospective/retrospective/solidarity strategies? María José Luzón also participated in the round table “English as a Lingua Franca in Higher Education: Local Perspectives of a Global Phenomenon”. 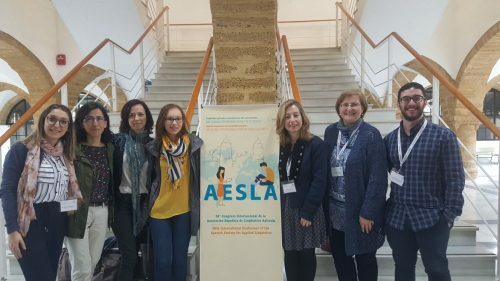 The round table provided an overview of current research being conducted at five Spanish universities (Murcia, Zaragoza, Lleida, Alacant and Málaga) with regards to English as a Lingua Franca.